It’s almost guaranteed that you’ll never make enough of these, unless your group happens to be filled with monsters who don’t like mushrooms. (If that’s the case, time to get new friends…) Seriously, though, these are great because they’re super simple to do and there’s a thousand variations. As usual, this can just as easily be done at home in the oven as at the campsite on a grill or open fire with a grill grate. You don’t have to pouch these in foil necessarily, but it does help keep the mushrooms a little more moist. If you like them to be a little more fire-kissed and have the outside get that nice grill color and flavor, then feel free to uninvite the foil from the party. What’s great here is that you can do a lot of the work at home and transport to the campsite for only a step or two left to do, which I’m a big fan of. It’s a lot harder to clean dishes at the campsite, so I like to use as few as possible. In a large mixing bowl, combine all ingredients except the mushrooms. (You didn’t really have to be told that, right?) Make sure you mix thoroughly. If you want to leave the meat out, use ½ cup of bread crumbs instead. If you want to stuff the mushrooms at home, what you do is use a large plastic bowl with a lid and separate the layers with foil or plastic wrap. Keep them chilled in the fridge and transport in a cooler with ice. If you’re going to stuff them at the campsite, just transfer the stuffing to a large plastic zip-top bag or another plastic bowl with a lid. This is a good one to let the kids in on. I think it’s easier to use a fork for this. Mushroom sizes vary greatly, but you’re going to be using somewhere between a teaspoon and a tablespoon of stuffing for each mushroom. The size of the mound past the brim on the mushroom cap should be about half the size of the mushroom itself. 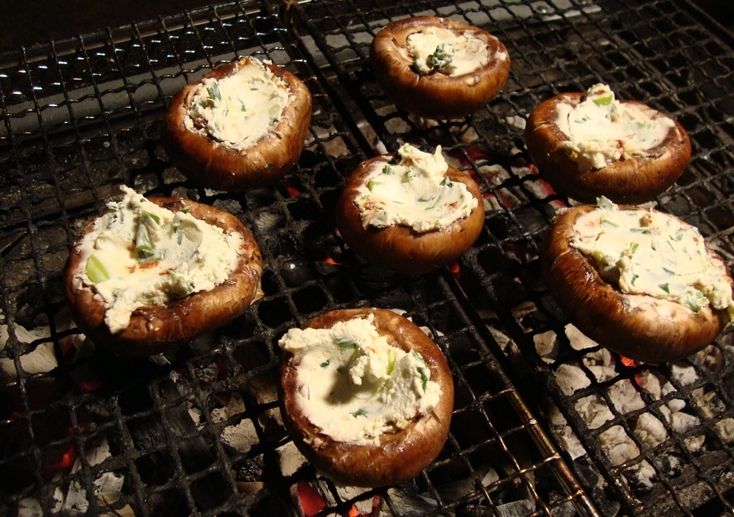 You’ll need to have tongs for this: Place mushrooms over medium heat in rows. Cook time will be about 25 minutes. You can also carefully wrap them in foil, in groups, and seal. Make sure you leave an opening for steam to escape. It doesn’t matter which way you do it; it’s just personal preference. Remove with tongs and let cool for at least 5 minutes. Come ‘n get em! There are few things more enjoyable during a night in camp than staring at the night sky. Now you can be a celestial expert and dazzle your camp mates with your night sky knowledge. There’s lots going in the November night sky, so grab your telescope and your tent and get out there! November – Rosetta Comet Landing. The European Space Agency’s Rosetta spacecraft is scheduled to release its Philae lander some time in November. Philae will attempt to land on the surface of a comet known as 67P/Churyumov–Gerasimenko. The lander is named after Philae island in the Nile river, where an obelisk was found that was used to decipher Egyptian hieroglyphics along with the famous Rosetta Stone. The Philae lander will spend about a week studying the comet. It will send back images from the surface and try to determine what the comet is made of. November 5, 6 – South Taurids Meteor Shower. The Taurids is a long-running minor meteor shower producing only about 5-10 meteors per hour. It is unusual in that it consists of two separate streams. The first is produced by dust grains from Asteroid 2004 TG10. The second stream is produced by debris left behind by Comet 2P Encke. The shower runs annually from September 7 to December 10. It peaks this year on the the night of November 5. Unfortunately the full moon this year will block out all but the brightest meteors. Those with patience may still be able to catch a few good ones. Best viewing will be just after midnight from a dark location far away from city lights. Meteors will radiate from the constellation Taurus, but can appear anywhere in the sky. Hammock camping is growing in popularity due to it’s convenience. With less gear than traditional tent camping, many people are choosing hammock camping as a way to lighten up their backpacks. Another asset of hammock camping is the variety of camp site options. No need to find a flat, open, dry spot for your site. You just need a couple of trees and some light rigging and you’re set. But it is not quite as simple as just hanging your hammock between two trees – in order to get the most of your hammock camping experience, you must first learn the finer points of hanging out in camp. One to 1.5 in (2.5 to 3.8 cm) polyester or polypropylene webbing straps help disperse the weight and reduce damage to trees or other objects. PahaQue Hammocks come complete with their own adjustable hanging strap system. Polyester and polypropylene are also low-stretch, so you won’t sag during the night (avoid nylon straps, which stretch). Pitching a hammock too tight between anchor points puts an enormous amount of force on the suspension lines and hammock, leading to potential failure (and discomfort). A tight pitch also raises the center of gravity, making the hammock unsteady. Pitching the hammock at 30° ensures you get a deep sag. A lot of beginners try to sleep in line with the hammock, curving their bodies into a banana shape. I find that this takes a lot of effort, because with a good sag, your feet naturally slide to one side or the other, finding a “pocket” of fabric. By angling your body askew of center, you fall into a ergonomically flat position (it looks a bit like a recumbent bicyclist), where the hammock takes away all the pressure points naturally. The diagonal lay is the key to comfort in a gathered-end hammock. Here is a great quick-reference guide for properly setting up your Hammock.